If you follow me on Instagram, you might’ve seen the photo I posted of a warm, fudgy cookie… with hints of pecans and chocolate chips peeking out from every direction. You might’ve also seen that I registered for my second half marathon, the Disney Princess Half. I’m not sure if I’m driven or just plain crazy. I think back to the days right after I completed my first half and I don’t think I could’ve run a mile if you’d paid me. But once I recovered and got back into my routine, I kept thinking about running another one. So I made it official last week: registered, began training and jumped completely back on that diet wagon. That’s why I’m sharing these cookies with you now, before I start to crave them next month or in the days leading up to the race. They’re so indulgent and perfect with a big cold glass of milk… I might just have to save one for my weekend treat! Melt the bittersweet chocolate chips and butter in the top of a double boiler or in a heatproof bowl over barely simmering water, stirring occasionally until smooth. In a large bowl, beat the eggs and sugar with an electric mixer until thick; then, mix in the chocolate mixture. In a small bowl, whisk together the flour and baking powder; then, gradually mix into the chocolate mixture. Gently stir in the chocolate chips and pecans. Using a sheet of plastic wrap, form the dough into two logs, each 2 inches in diameter and about 8 inches long. Because the dough will be quite soft, use the plastic wrap to hold the dough in the log shape. Wrap tightly; refrigerate for at least 1 hour or until firm. Preheat the oven to 375 degrees F and line a baking sheet with parchment paper. Unwrap the dough and with a sharp knife, cut the dough into 3/4-inch slices. Place the slices 1-1/2 inches apart on the prepared cookie sheet. Bake for 12 to 14 minutes, or until a shiny crust forms on top of the cookies but the interior is still soft. Let cool on the baking sheet, then remove from the baking sheet with a metal spatula. Store in an airtight container at room temperature for up to one week. Wow! 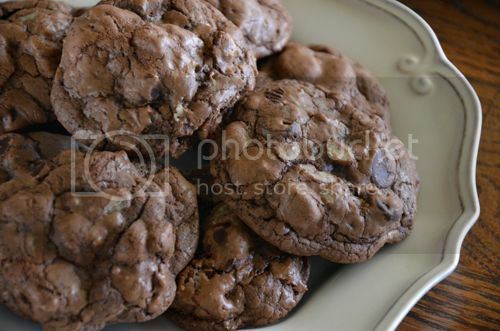 These cookies look amazing, double chocolate? Yes! Thanks for sharing! These look and sound sinful. I bet that Ghirardelli chocolate makes them very decadent. Girl!! You had me at hello with these cookies!! Holy yum! And ROCK ON with your bad self! I think it’s awesome that you signed up for another half! Love pecans! These look great! Double chocolate? Yup, we’d go nuts for these beauties! These cookies sound fantastic! 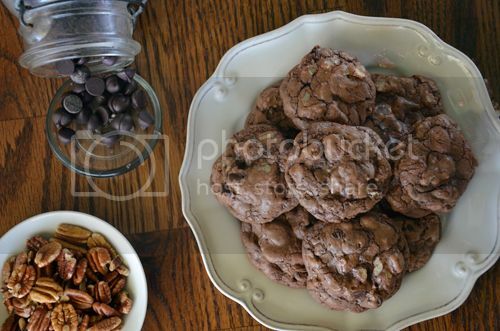 Pecans and chocolate…yummy! 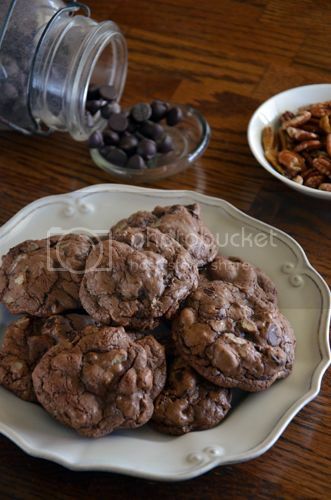 I just made some very similar chocolaty cookies that I’m working on a post for, but I made them gluten free! Love these!